Dollar Music Society has been promoting music and the arts around Dollar, Clackmannanshire, Scotland, since 1965. We organise an annual series of concerts, featuring professional musicians and a wide range of musical styles. We also organise events such as excursions, one-off concerts and music competitions. For example, in 2013 we put on a concert for children, which was a huge sell-out hit. In 2015 we will pass the half century mark, so will be celebrating with some events - watch the news section! All events are open to anyone, so if a concert or other event appeals to you then please just turn up. If you like what we do then why not become a member? It only costs £5 per year, and comes with benefits such as cheaper entry to concerts and priority booking for events. 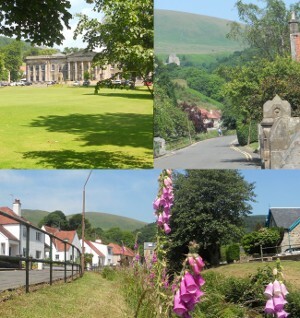 Dollar is a pretty town nestling under the Ochil hills in Clackmannanshire, Scotland. Population around 3000. The name Dollar has nothing to do with money or silver! It is probably derived from the Pictish word dol , meaning field. The town is dominated by two iconic buildings. Castle Campbell sits high above the town at the head of Dollar Glen. It was the lowland seat of the Duke of Argyll. In recent times Dollar has been closely associated with Dollar Academy, with its magnificent Greek influenced Playfair building.